US President George W Bush has praised Iraqi PM Nouri Maliki's "bold decision" in ordering Iraqi forces to crack down on Shia militias in the city of Basra. Heavy fighting continued in the city for a third day between militias and security forces, with violence in other parts of southern Iraq and Baghdad. The clashes have claimed more than 130 lives since Tuesday. Mr Maliki vowed that he would continue the fight against the militias for as long as was necessary. "We have made up our minds to enter this battle and we will continue until the end. No retreat," Mr Maliki said in a speech broadcast on Iraqi state television. The prime minister has personally overseen the operation in Basra, which involves some 30,000 troops and police. But Mehdi Army fighters loyal to radical Shia cleric Moqtada Sadr remain in control of some densely-populated areas. 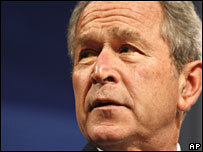 Speaking at a US Air Force museum in Dayton, Ohio, Mr Bush said "normalcy" was returning to Iraq. "As we speak Iraqis are waging a tough battle against militia fighters and criminals in Basra, many of whom have received arms and training and funding from Iran," he said. Mr Maliki's move against Basra's militias underlined "his leadership and his commitment to enforce the law in an even-handed manner", the US president added. He spoke as one of several Americans injured this week in rocket attacks on Baghdad's Green Zone died, amid fresh missiles attacks on the fortified area. Meanwhile, one of Iraq's two main oil export pipelines from Basra was blown up in a bomb attack, sending oil prices above $107 a barrel. And Basra's police chief survived a bomb attack that killed three of his bodyguards. With many shops and markets shut, residents in the city said they were beginning to run out of food and water. In Baghdad, thousands of Sadr supporters marched to demand Mr Maliki quit over the Basra operation and there was sporadic fighting in Shia areas of the capital. The number of gunfights in southern Iraq appears to be growing, says the BBC's Crispin Thorold in Baghdad. The fighting still seems to be mainly with members of the Mehdi Army, our correspondent says. The militia had held to a ceasefire since last August, contributing to the general fall in violence across Iraq. The government says it aims to re-impose law and order in Basra, which the British military handed over to Iraqi forces in December. However, Moqtada Sadr's supporters say the government wants to weaken the militias before local elections in October. At stake, analysts say, is control of Iraq's only port city and the region's oil fields.